Donna's chitchat: Do your kids behave when they have a babysitter? We were away for 10 days on a trip that took us to New Brunswick, Quebec and Ottawa. While we were away, our young neighbour Ashley, her little brother Patrick and their dad, Rob... took care of the house and the cats. Scared of her own shadow. She is just starting to enjoy sitting on the deck, while we are with her and while the door stays OPEN... at all times. She sits for quite a while in the door before she ventures out. We were gone for 10 days and we have never been away from the house for that long so I was worried about the kitties. I had Ashley over and explained about each cat (over protective Mother, you know) and how they like this, or that, and about Tonks being shy (which she already knew). 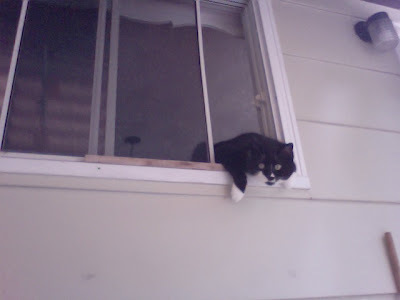 I asked that she make sure that Paralax was in before dark every night, and Pika could stay out for the night, since he seems to like to cause trouble in the middle of the night, trying to get out (usually knocking stuff off the dressers or ripping up toilet paper). Ashley had all her instructions typed out on the fridge... Tonks stays in always, Paralax can go out anytime but in before dark.. and Pika out all night..
After we got back and I talked to Ashley.. she explained that the black cat kept getting out of the house.. by the window... and I knew she was mixed up and meant Paralax or Pika, so we giggled over how bad they were.. and I left... wondering how they got out. That evening Terry comes home after visiting Ashley's dad... with a real tale. Rob reminded Ashley to go and put the cats in or out each day and evening. One night he told Ashley to go feed them and make sure they were all in for the evening. Rob went out and came home 2 hours later and one of our cats was sitting on the door step, outside. He asked Ashley if she had put them in.. and she said she did.. but somehow one of the cats got out. He went over and put the BLACK cat back in. We only have one black cat... and that would be TONKS!!! Same thing happened 2 more times..... but it wasn't just Tonks getting out, it was Paralax too. After the third time, Rob walked all through the house and couldn't figure out how they were getting out.. until he went to the back yard to water our garden.